Then I got another copy with a handwritten note from Lucy… good tactic I now felt guilty that I hadn’t read it sooner. Obviously I am old fashioned but a hand written note is lovely to receive! The original plan had been to read this over New Year as that is when it is set! So friends & their partners from university meet up and travel to the highlands for a new year break in a very isolated area where they are ultimately cut off from everyone due to adverse snow! It’s kind of like a locked room mystery but obviously on acres of land and you are always wondering if the guilty party is part of the friendship group, part of the staff, other visitors, or unknown persons trespassing on the land! You are even left guessing for a good while who the victim actually is! So very good – I finished it early evening last night and it has played in my head since then! So much so that I have now started a previous book of Lucy’s (historical fiction) that yes, had been sitting in my pile for a while! I am very happy to recommend this book to ALL, and hopefully a sometime in 2019 Lucy will be formally visiting Waterstones Durham to sign ALL her books! Thanks to Fiona for the great recommendation. 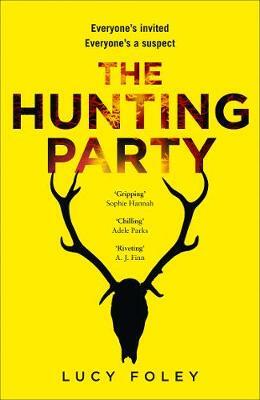 Absolutely loved The Hunting Party and meeting Lucy Foley. It’s perfect for any crime fan with very well developed characters, my favourite being Miranda. The way it’s told through the eyes of the main characters of the group makes you feel like a fly on the wall throughout. A very impressive crime debut and the best crime book I’ve read so far this year. The Hunting Party was one of my 2019 must read books. I’d first been made aware of this book on Twitter, and it was getting a lot of attention. As soon as it was published, i picked up a copy and it went straight to the top of my tbr. I read the book in less than 24 hours, i struggled to put it down, and it was my first 5 star read of 2019. The book has well developed characters, and the remote location is well described. I was fortunate enough to meet Lucy Foley at Waterstones Durham and get my copy signed. I’d recommend this to anyone who likes crime.